People who develop skincare have to wear a lot of hats and face many challenges but I find it particularly interesting when different philosophies get combined and together produce powerful results. Su-Man Hsu was born & raised in Taiwan but she has spent many years working in Europe and when she developed her skincare products ( six in total to start with because six is considered to be a perfect number by Chinese people ) she combined the best of Eastern and Western practises. You start with the simple packaging, white paper boxes with the golden ‘S’ and purple ‘Su-Man’ lettering and then you get the products out, not necessarily expecting to be surprised but then you start testing the products you notice the smell and the texture and your journey of this skincare ( ” An elegant warrior that dances on your skin until the light shines through” alluding to Su-Man’s ability to combine two passions, for dance and for skincare ) begins in earnest. Purifying Cleansing Gel-Oil, 125 mls, £40 ( suitable for all skin types ),‘: what surprised me from the word go’ was the texture of this cleansing oil – it looks a feels like a slightly thicker moisturiser but as soon as you apply it you notice the beautiful glow that it imparts on the skin. This cleanser is a hybrid, combining the oil and the water-based-gel and aims to clear the make-up and the dirt from your skin thoroughly, yet without stripping the skin. The gel-oil easily glides over your skin, feeling as if it is melting into it. Wintergreen, rosehip and dragon’s blood extract ( you can read in more detail about the ingredients in part one here ) is clean the pores from accumulated impurities and help protect your complexion from the environmental aggressors we all experience daily, whether we live in the city or in the countryside. You can use this product to remove your eye make-up and it works well on removing mascara as well ( I tend to wear one coat, so in my experience this cleansing oil is truly effective at removing it, as well as the eye-shadow ). Apply a pea-sized amount to the dry skin and massage it in, ‘waking up’ & energising the circulation. Then rinse it off with warm , not hot water ( as you add water the clear gel-oil turns from clear to white colour ) and pat skin gently dry. You will notice a subtle glow to your skin, even before you apply your serum or moisturiser.My skin felt soft to the touch – a first step in the skincare routine in the right direction. Another practical point is that the lid is twistable, so you can use it in the shower or pack it into your beauty bag in the suitcase without the worry that is will leak. Su-Man Hsu Exfoliating Facial Polish, 125 mls, £40: The first thing that got me hooked on this product is the smell of the freshly roasted coffee, when you squeeze it out on to your hand. This brown-coloured oil based exfoliator is a wake-up complexion delight – it will refresh your senses at the same time as well. Squeeze out a small amount and spread it all over your cleansed face with your fingers ( I wish mine were as nimble as Su-Man’s ) as coffee granules lift dead skin away and the oil soothes the skin, without stripping its protective barrier. Su- Man added coffee because of its high caffeine content and because of its ability to physically resurface and soothe inflammation, whilst awakening your senses. Until I tried this face exfoliator, I was used to scrubbing my body with the coffee grains left after my morning coffee or with an occasional body scrub which contains it, so this is a welcome delight for any coffee and skincare lover. I also notice that after using this exfoliator the pores seem to appear smaller in size and the skin itself doesn’t have any redness, even though the actual grains aren’t tiny. One of my favourite evening skincare routine indulgencies ( I do it once a week ) is to apply a small amount of this polish to my lips and exfoliating them, as well as around them, for soft kissable lips. Top tip: don’t forget to shake the tube gentle, in order to mix the oil & coffee grains together, before squeezing the exfoliator out. This way it will retain its consistency & potency. Su-Man Hsu Rehydrating Toning Essence, 100 mls, £37: Su-Man herself describes this toner as a bridge between cleansing and moisturising. This essence is unlike any other I tried before when it comes to its texture. I can only describe as gel-like-water. Once it hits your skin, it transforms into an instant, refreshing hydrator for your skin. You have Hyaluronic Acid, which replenishes moisture, Green Tea Extract and Rosa Centifolia Flower Water which helps to repair and soften the skin. It sinks into your skin as if it was water evaporating under the sun’s glare, yet you are left with the feeling of plumpness and dewyness. All you have to do is pat it ever so delicately into your skin, all over your face, neck and decollette and enjoy the wonderful sensation of dewy plumpness. When I listen to toner presentations I am not often convinced, as I have been using Evian atomiser since my teens and now that I am in my late thirties I want my products to be effective, as well as beautiful and time-saving, making it worthwhile incorporating them into my morning or evening skincare routine. This toner will change your mind and Su-Man insists that toner is an essential part of your daily skincare routine. Using it straight after cleansing, before your apply your moisturiser or serum, is like priming canvas before painting. Su-Man Hsu Velvet Skin Brightening Serum, 30 mls, £98 ( suitable for all skin types ): When you open the packaging and set the glass bottle what you see if a magic potion – the bottle seems to be filled with clear fluid at the top half and a red liquid at the bottom, creating a beautiful visual moment every time you look at it. Before you apply the serum you need to shake the bottle, to mix the ingredients before your eyes. Dispense a drop or two into the palm of your hand and then spread it all over you face & neck. It looks like a dewy, lightest oil that spreads radiance all over the skin, making it glow. The serum combines the power of Hyaluronic & Tranexamic acids, Omega oils, Ceramides and dragon blood extract, fusion of which helps to even out the lines that you already might have on your face and helps the skin appear and feel firmer. I find that it is enough for my skin to use this serum on its own, without topping it up with your moisturiser ( if you feel like your skin needs more moisture, add a drop or two of the serum into your moisturiser and apply as usual ) in the evening. If you feel like you want to give your skin a rest from make-up, apply the serum in the morning and then dab concealer and bronzer when needed, smooth lip balm or lip gloss over your lips, curl your eye-lashes and you are ready to leave home looking pulled together. Su-Man Hsu Velvet Skin Moisturising Cream, 50 mls, £95 ( suitable for all skin types ): as with all of Su-Man’s products, a little goes a long way, particularly with this richly indulgent moisturiser. The moisturiser feels very light on the skin and is quickly absorbed and one of its main aims is to age proof your skin – if you saw Su-Man’s skin beautiful, even, blemish free and she has less wrinkles than I do, if at all, the best testament to the efficacy of your skincare regime. The moisturiser contains powerful peptides ( still a big buzz word in the world of skincare ), a high concentration of active ingredients ( do a patch test on your skin if yours is sensitive, to be on the safe side ), plus the resin extract of dragon blood and rosehip oil that nurtures the skin and helps to moisturise it and plump the skin. Massage it firmly, with active strokes from your neck up, moving your muscles but not pulling them, waking up the skin and boosting your circulation and in time you will also notice increase luminosity – I did after using it for about four weeks. This moisturiser also allows your skin to ‘breath’ and not feel overwhelmed but what you massage on to it. Su-Man Hsu Awakening Eye Lift, 15mls, £55: Eyes are the windows of the soul, as well as the barometer of our health, as a good iridiologist would tell you, so a good eye cream and the right application ( unlike many practitioners Su-Man recommends a zig-zag motion when applying the eye cream and doing it concentrating the movement along/around the orbital bone, thus boosting the circulation and hopefully improving the appearance of the dark shadows if you have them ). The Eye Lift has two premium peptides, Eyeliss and Haloxyl, with the added benefit of spirulina ( it doesn’t have to go just into your smoothie or juice ) and dragon blood, so together they will refine the texture of the delicate skin around the eye area and help improve the problem of puffiness and tiredness if you are prone to them. The texture of the Eye Lift is like a fusion of moisturiser and gel, it feels a little bouncy to the touch and leaves behind a delicate trace of illumination, almost light a pearly highlighter, barely noticeable yet effective in rejuvenating the tiredness. 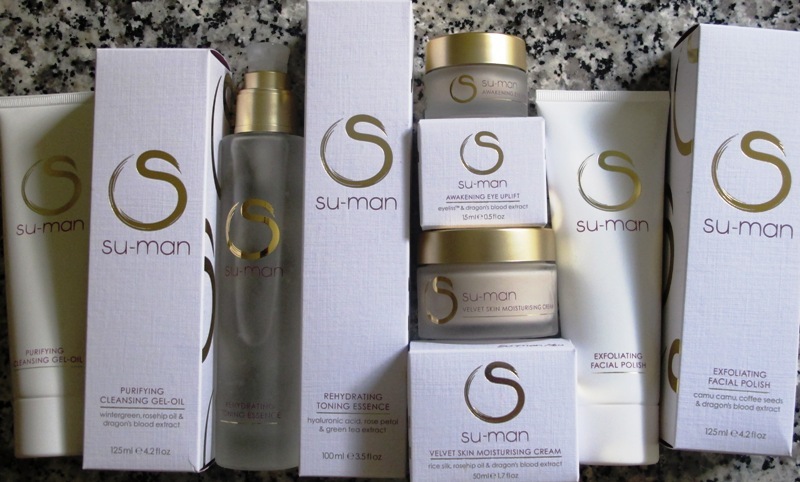 Su-Man thinks of so many points when she develops her products, it’s the efficacy, the smell, the look, the result – it’s as if she looks at each product turning the full 360, not missing any small detail and making sure that her products delight the customers. You feel it as soon as you apply them to your skin and see your skin respond to them. I intentionally put only one link to the product video, as I hope you will be curious enough to go on Su-Man’s website and have a look at the individual videos with lots of useful tips to the best way to use each product by Su-Man demonstrating the best techniques as well. Another additional bonus, if you want to discover her range of products, is the starter kit called ‘The Essential Discovery Collection’, which includes generous miniatures of Cleansing Gel Oil, Exfoliating Polish and Face Serum. And don’t forget that ‘products are designed to be massaged in a layering system, they work best as a family’, according to Su-Man. Hence the light textures, very much in tune with the Asian philosophy of ‘several small healthy dishes and not just one heavy one’. Like Charlie, these beautiful products will be out of my normal budget but as always you give us such an insight on the products you discover and tested that I am won and want to order the starter kit. Would you know how to get it? As you guessed with my Asian & Western mix I am totally drawn by Su-Man’s philosophy: purifying, energizing and nourishing in many different layers. Your skin and face are a testament of the good care you give them! Love the link you added. Always useful to see how you are supposed to massage in the product.